Castor oil is popularly known to promote hair growth, prevent or reduce baldness, and so much more. Used on its own, castor oil is a pretty effective remedy for all the listed above. But, is there another oil, perhaps an essential oil, which can also aid in hair growth, reduce hair thinning, and stimulate blood circulation? Yes! Rosemary oil does all of those things (and more). 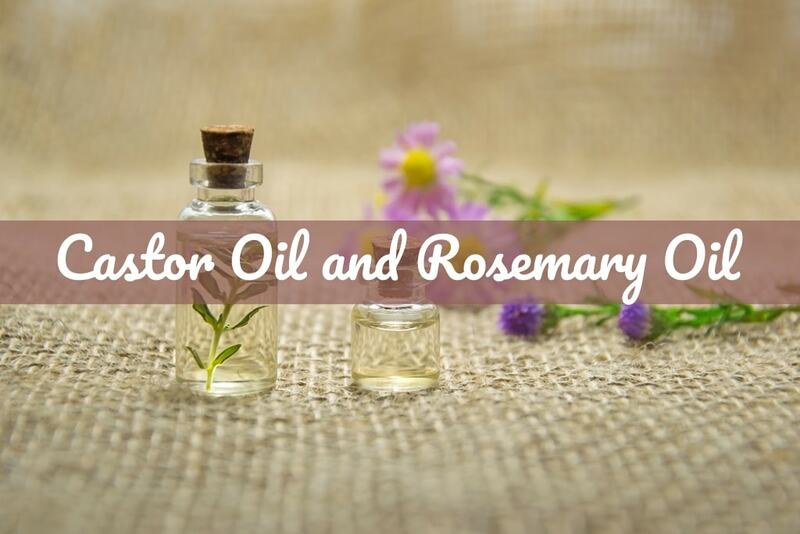 Discover my guide to castor oil and rosemary oil and get the recipes below! What Is Rosemary Oil Used for? Rosemary oil is one of the better known essential oils and for good reason. Its benefits greatly outweigh the small price to pay to keep a bottle handy in your bathroom or kitchen cabinet. While commonly used for its medicinal purposes, rosemary oil is also helpful in preventing hair loss, encouraging hair regrowth, among other benefits. While it is said that rosemary oil can relieve stress, improve cognitive function, disinfect wounds, and more, it’s worth noting that not all claims are backed up with proven research . A 2015 study revealed the effects of rosemary oil vs. minoxidil on hair regrowth in people with DHT-related hair loss after six months. The subjects who received rosemary oil for six months had the most positive result. Not only was the hair growth more significant, less amount of subjects had itchy scalps . The use of rosemary oil on your hair to prevent baldness is not guaranteed, as baldness is the result of many different factors. For another example, rosemary oil can help encourage hair regrowth if the hair thinning was due to a scalp fungus or bacteria. Rosemary oil helps to disinfect and kill off bacteria. The good news is, rosemary oil does have blood stimulating effects. Like castor oil, rosemary oil helps promote the growth of new hair follicles. Using rosemary oil is another way to boost your hair growth efforts the natural way. Why not try it and see for yourself? Castor oil and rosemary oil have both been popular natural remedies for centuries to cure ailments or to enhance beauty. Like rosemary oil, castor oil is wonderful at stimulating your scalp to promote hair growth. Combining the two oils not only enhances their benefits, but it helps facilitate application too since rosemary oil is best used with a carrier oil (like castor oil). Not to mention, the aroma of rosemary essential oil makes for an additional pleasant experience. There are several recipes you can create using both castor oil and rosemary oil. Can’t use castor oil? Then check here to see my list of alternative oils you can use. If you need to adjust the castor oil amount to suit your needs, please do so. Have fun with these recipes and I hope you like the three different scents (earthy, tropical, and clean!). Please use your own judgement when you apply these oils. Don’t use too much, and make sure to dilute the essentials oils with castor oil, coconut oil, or another type of carrier oil before applying to your skin or hair. Castor oil and rosemary oil has lots to offer. Feel free to play around with the above recipes to make them your own! I am positive that you can find your perfect balance with castor oil and rosemary oil to help you with hair growth or regrowth, skin irritations, headaches, and more. Best of luck and as always, drop your questions here below so I can respond to your queries!